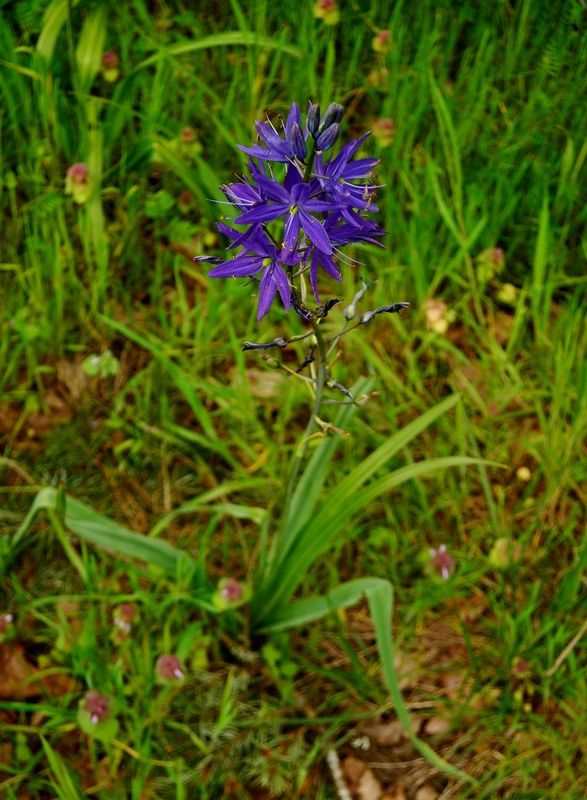 Common Camas (Scientifically known as Camassia quamash) was not only an important staple in the Native American community but also served as an important role in the Lewis and Clark expedition. One fall morning in the year 1805 the famished Expeditionist approached two Indian villages on Weippe Prairie. They were presented with a variety of local foods one of which was a flower bulb “much like an onion which they” the natives “call quamash” -M. Lewis. Even though the crew had become ‘Ill to their stomach’ from over consumption of the bulb, Camas had become a strong interest of Lewis to which he wrote many pages describing the plant in detail. Camas is derived from the Nootka Indian word chamas, which means ‘sweet’. Nez Perce tribe, Camas harvest. 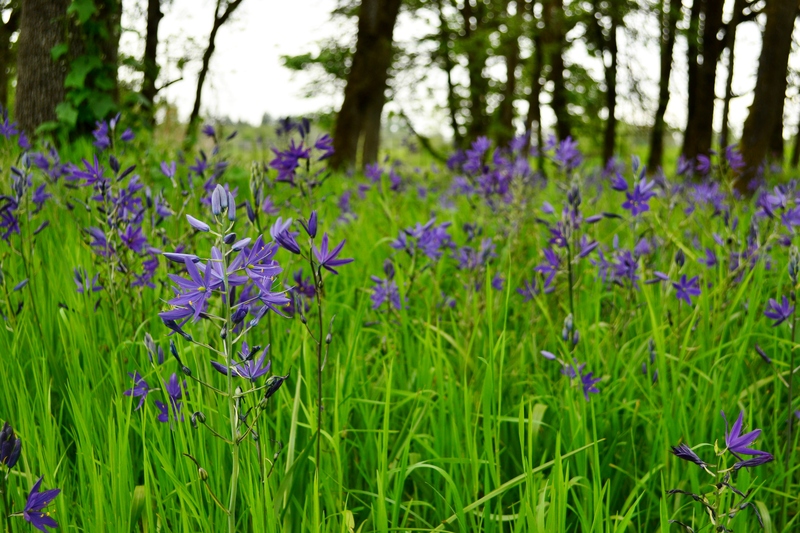 Camas had long been prized by the Native Americans sometimes resulting in intertribal wars. The bulbs were harvested during bloom as not to be confused with the cream colored Death Camas. They were eaten either raw or roasted, or dried and ground for storage. Camas bulbs are packed with inulin a long-chain sugar. Once cooked the inlulin is broken down into a more digestible fructose. The freshly roasted bulb is reported to be very sweet and to taste similar to a baked pear or pumpkin. The Camas bulb is a good source of natural Sugar calories with traces of Vitamin C, Calcium, Iron and Magnesium. If not eaten as a food itself the cooked bulb served well as a sweetener for beverages or cakes. Camas bulbs are still prized today as a delicacy. However because of their reduction in the wild care should be taken to enjoy these either domestically grown, or in a survival situation. Provided are a few links with the different ways to prepare Camas bulbs. 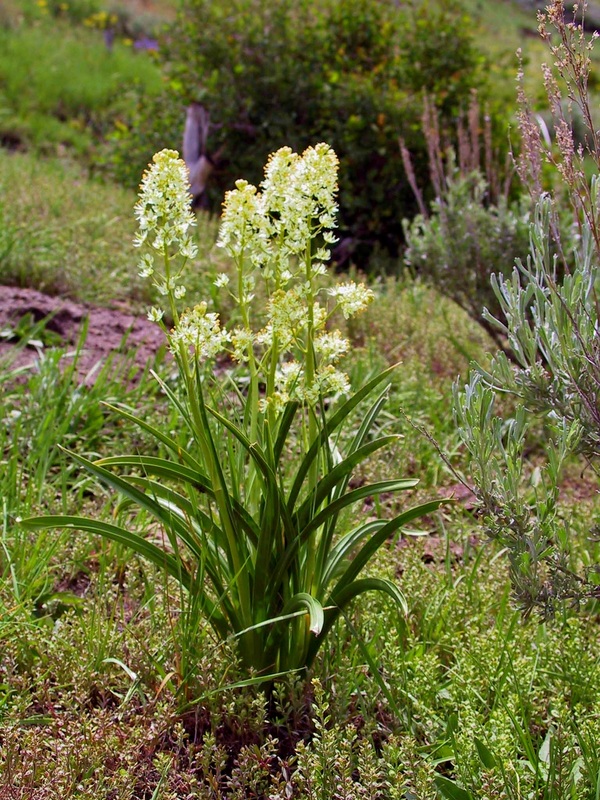 Death Camas has cream colored flowers and bulbs that look like onions yet lacking its smell – DO NOT EAT. 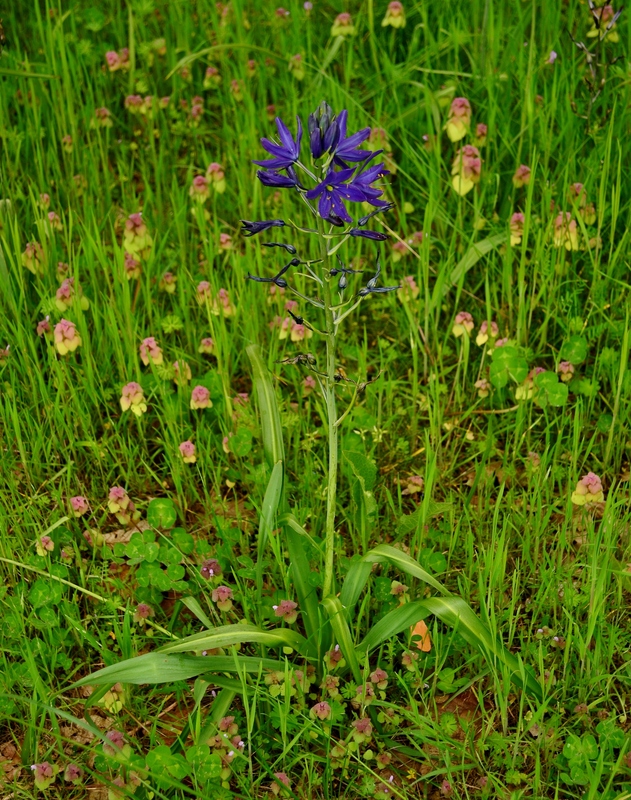 Death Camas often grows with Blue Camas – harvest is most wise during bloom. Perennial herb in the Asparagus family, growing up to 30″ tall from a deep onion shaped bulb 1-3″ in diameter. Leaves are numerous, basal, grass-like, up to 1″ wide and 20″ long. Flowers Pale blue to deep purple – 1.5″ long, growing 5 to 40 or more in a terminal spike. Fruit egg-shaped capsules 1″ long, stalk curved in towards stem. Grassy slopes and open meadows which are moist in spring drying out during summer months, low to middle elevations – most of the Pacific Northwest from California up to Alaska and as far east as Montana. Bulbs during Spring and Summer (April – June) while in bloom as not to be confused with the deadly look-alike death camas. This is a great site! I wanted to let you know that in your Lewisburg Saddle post about orchids you have a photograph of False Green Hellebore (Veratrum viride), which is a highly poisonous plant and does not have edible roots like the lady slipper. I love all the excellent photos and interesting quotes. Keep up the good work!